One pot creamy vegan tahini noodles are a quick, easy, and delicious dish in just one pot and under 12 minutes! Under 260 Calories per serving. I LOVE creamy, delicious noodle dishes. Thick, saucy, and full of rich flavor – filled to the top with delicious healthy vegetables. 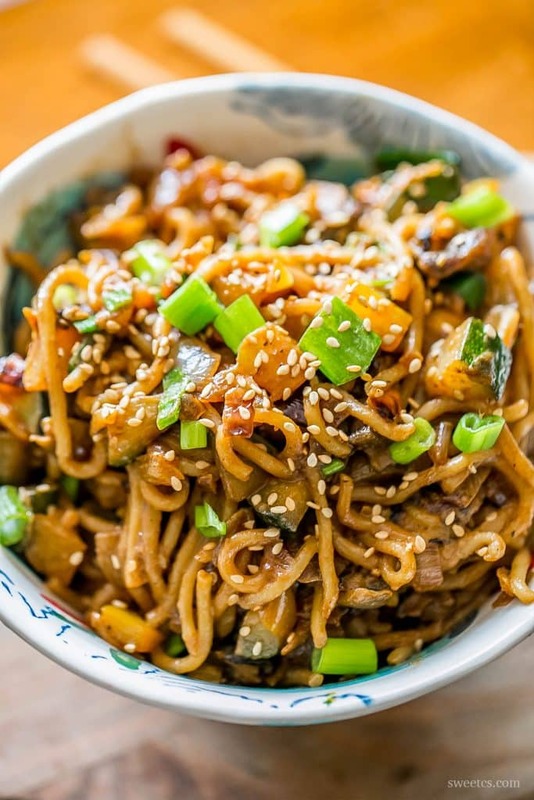 Lo mein, stir fry noodles, pad thai…. I love them all. 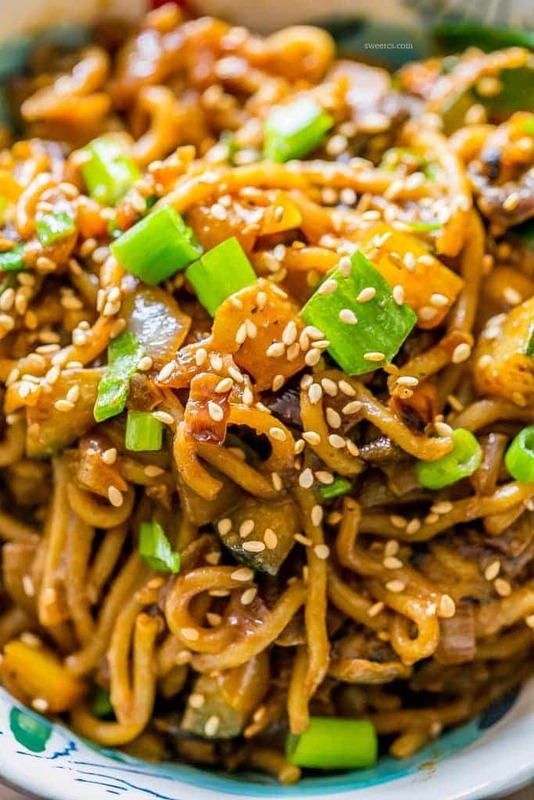 Street style noodles are one of my favorite meals for meatless mondays, lent- and anytime I’m craving something comforting that won’t weigh me down. 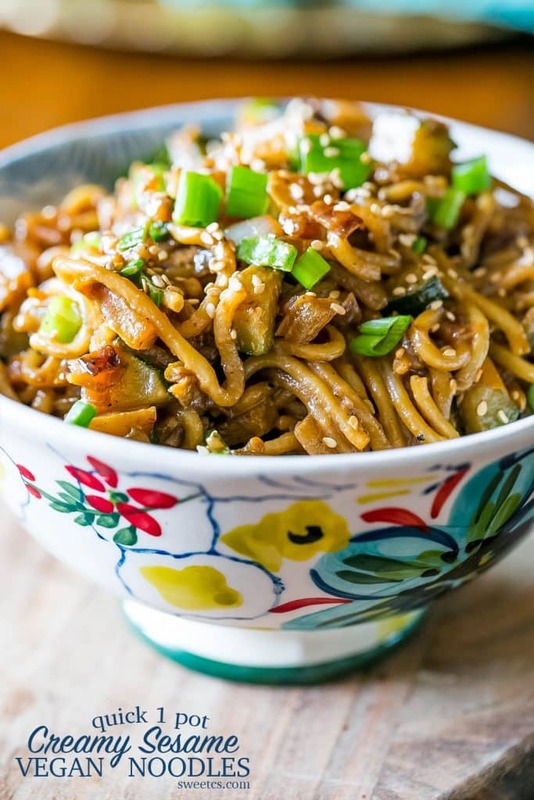 These noodles are FULL of rich and creamy flavor- thanks in part to tahini, which is a ground sesame paste. Tahini tastes a lot like peanut butter, with a little richer, more buttery flavor. The addition of tahini in this dish is so delicious- and it also adds some lean protein which is important when you’re eschewing meat in your diet. Check out just how easy this dish is to make! 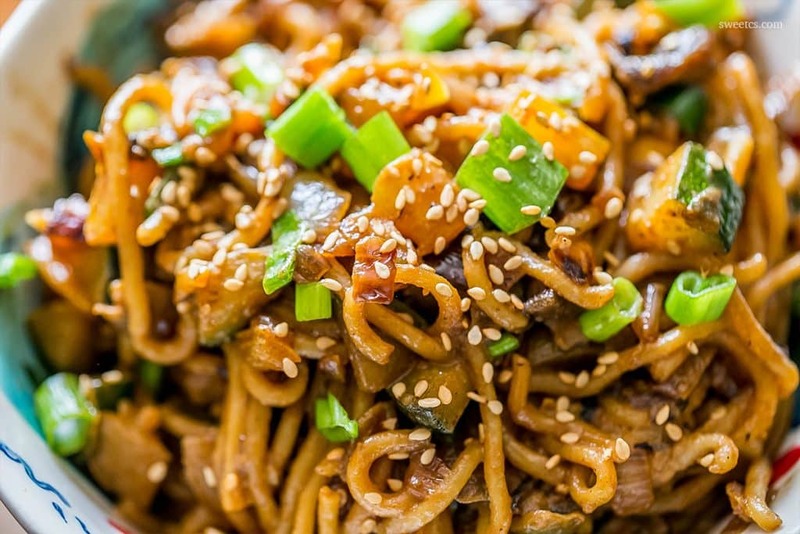 Use a heavy pan to cook your noodles and vegetables quickly. I prefer these heavyweight Mineral Iron pans – they heat evenly, are nonstick naturally after seasoned, and are great instead of woks if you don’t use a wok enough to justify purchasing one. Customize the way you like it! Don’t like zucchini? Double up on peppers! Have an eggplant you want to use up? Toss it in! Want more or less soy or sesame flavor? Change it up! This is a crazy versatile recipe. Use an oil with a high smoke point. Don’t burn your oil! Peanut, grapeseed, canola are all good choices. 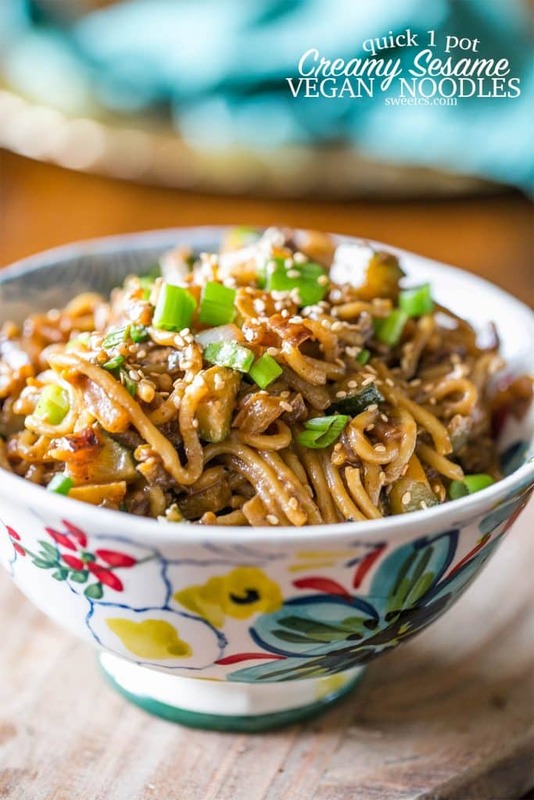 One pot creamy vegan tahini noodles are a quick, easy, and deliciously meaty tasting dish in just one pot and under 12 minutes! Full of vegetables and Under 260 Calories per serving. In a large, heavy skillet, heat oil on medium high. Add onion and shallot, tossing to prevent burning. After 2 minutes on high, onion and shallot should be lightly browned. Add peppers, zucchini, mushrooms, stir on high heat and lightly brown. Add noodles to pan, toss. Stir in tahini and mix well. 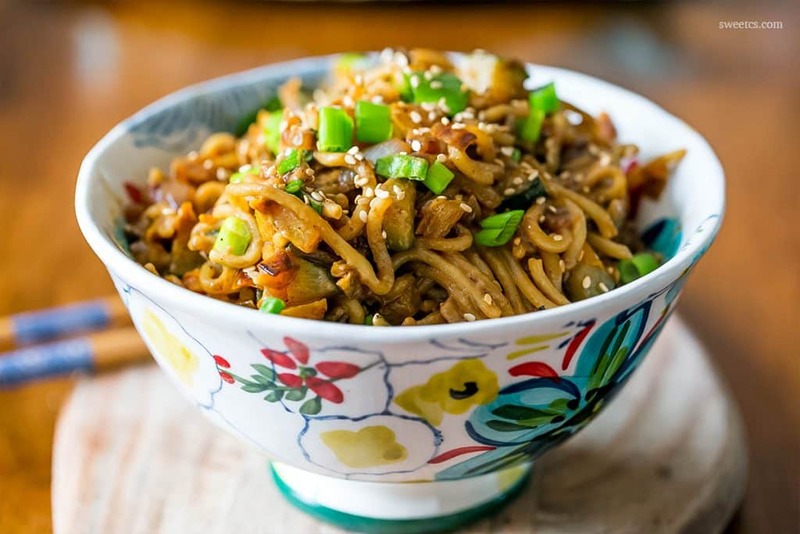 Sprinkle green onions and sesame seeds over noodles, plate immediately. All in all, it’s a wonderful recipe! I will use it often! This has become one of my favorite recipes. I make it often for my wife and I. Thank you for sharing it! I bet using a sesame oil would add a lot to this! 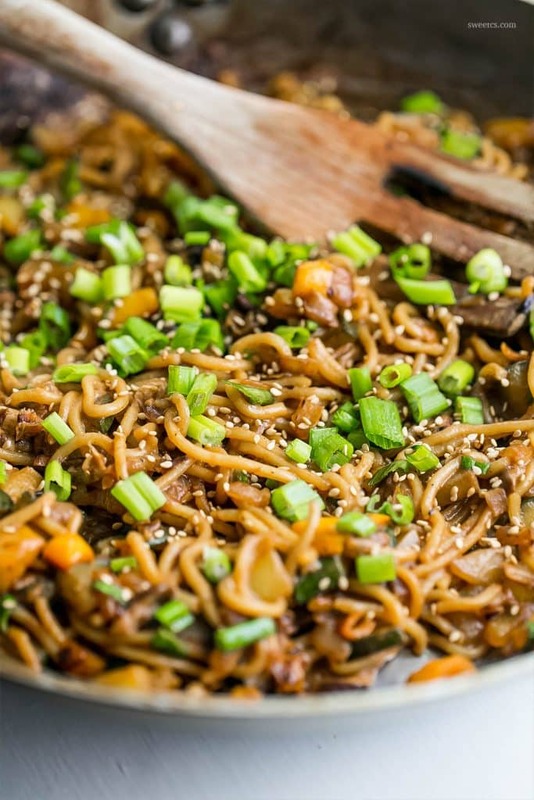 I usually stir fry my noodles in it and then add a bit of teriyaki to the noodles. 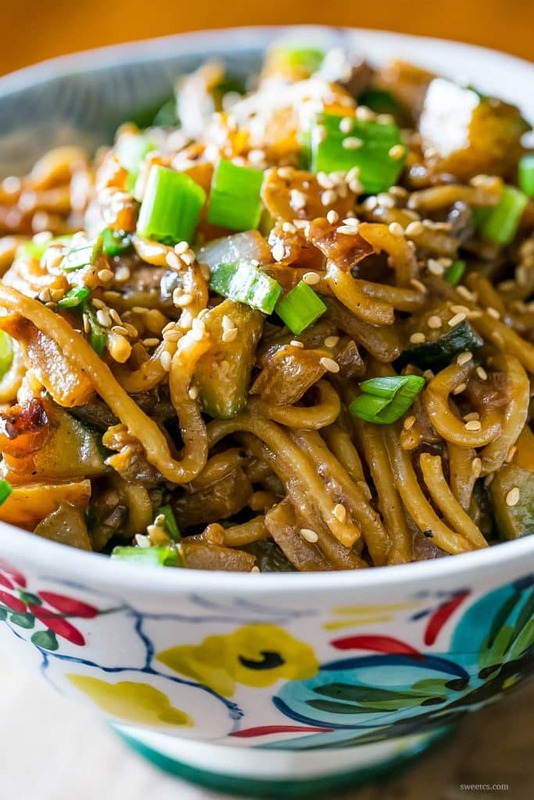 Those pre-cooked stir fried noodles would go good with your recipe! 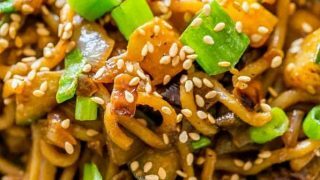 I LOVE finishing food with sesame and mongolian oil – I dont always put much in my recipes here because I know some people don’t love the flavor, but I sure do! Sounds perfect! The sodium level is way toooo high, but you could add that people can use a lite soy sauce. Other than that, make one similar to your’s, but next time will add the mirin. It is a very changeable recipe and can be easily adaptable to other veggies like broccoli or cabbage. However, go easy on the cabbage, it can change the flavor alot!. Thank you for sharing this delightful recipe! Awesome tips and additions, Ann! I do usually use a low sodium soy sauce, but I need to update the recipe to reflect that. Sometimes I forget when I use a product all the time not everyone does, lol!